9 HOURS! You see all the details! 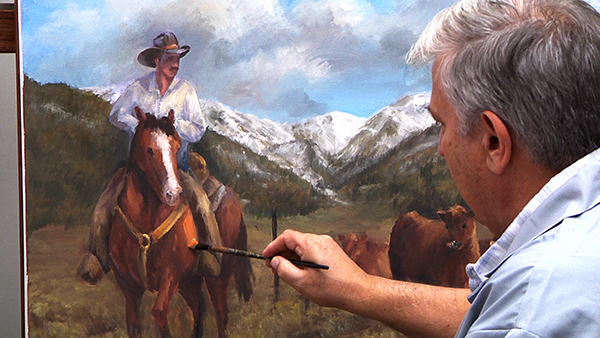 Join David for his first filmed western painting. David has been commission painting westerns for 4 years and now he will show you some of the techniques he uses to paint these large and impressive paintings. Each painting tells a story and David shares the creative process with you. Your journey begins with the story, design, palette and different techniques. Watch how he uses the gallery technique of broken color and warm cool contrast to bring the subject to life. David will show you his 4 step process in the creative process. Learn some quick methods for creating realistic snow covered mountains, cattle and moving the viewers eye through the painting. This video will be part of a western series where David will show some of his favorite painting techniques and color mixes. The next video in this series will build on the landscape portion of the painting with NEW mountain painting techniques. Start your journey today with this great western tradition of "Riding Fence"! Click the button below to add the DVD4032 Riding Fence to your wish list.